We’ve all had that moment when our creative mojo just escapes us. You’ve been there before, right? 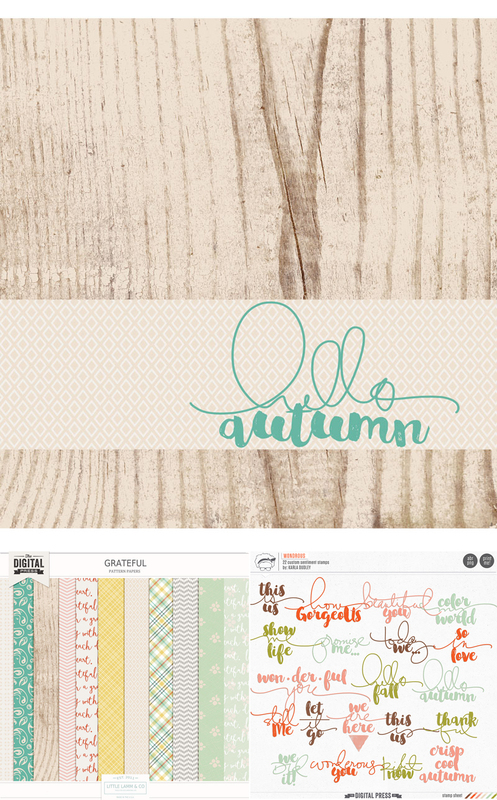 You’ve got the time to create… a brand new kit that you really want to work with… and nothing. So what do you do? Most of us browse galleries for inspiration, of course. Then you find “it” — a layout that has you saying, “wow, I really love that!” Maybe it’s the pictures, the composition/proportions on the page, the kit selection. Oh, hang on a minute… that’s your layout! Wow, that’s a little embarrassing. Actually, it’s not. Most of us are the resident memory-keeper for our family. 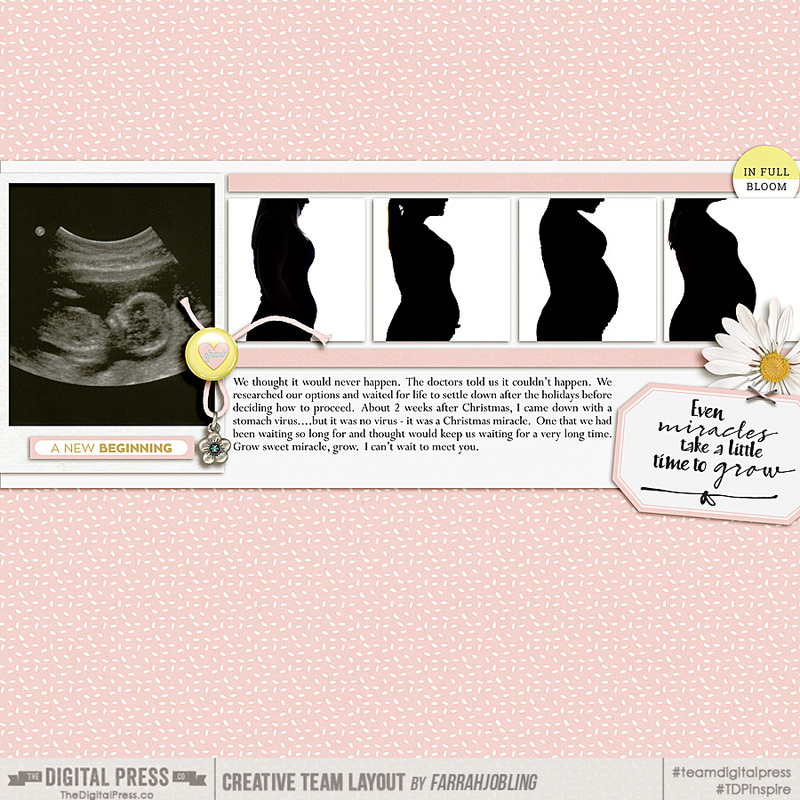 We should be proud of – and love – the layouts we create. 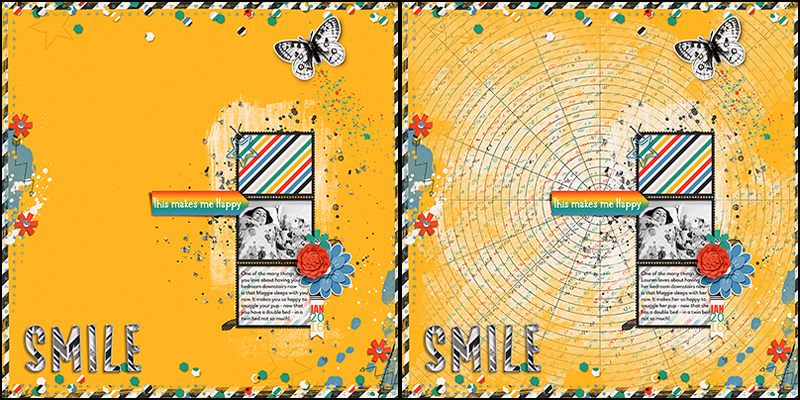 So how about using your own layouts as the inspiration for something new? 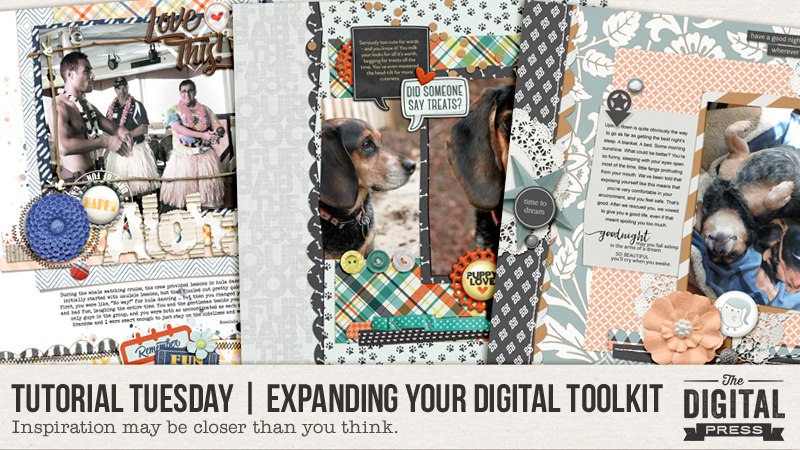 Yes, I’m talking about expanding your digital toolkit and scraplifting yourself! Now, I like to use my existing layouts as inspiration and not necessarily duplicate an existing design (although that’s a great option, too). With that in mind, now that I have the base design laid out in front of me, it’s time to play around by moving elements (or groups of elements) around to create something new. You’ll see that I’ve also hidden a few layers, like the element cluster that was originally in the upper left-hand corner of the new design. It was just too much. Also, at this point I haven’t even thought about a kit design, new papers, or new elements. I’ve simply been setting up the foundation on which to build from — and that’s not always easy to do, as I want to jump right in! Using this scraplifted version of my original layout, I can now start adding all of the new pieces to complete my layout. If I move things around again, that’s fine — it’s my page, my memory. I can do whatever I like with it. 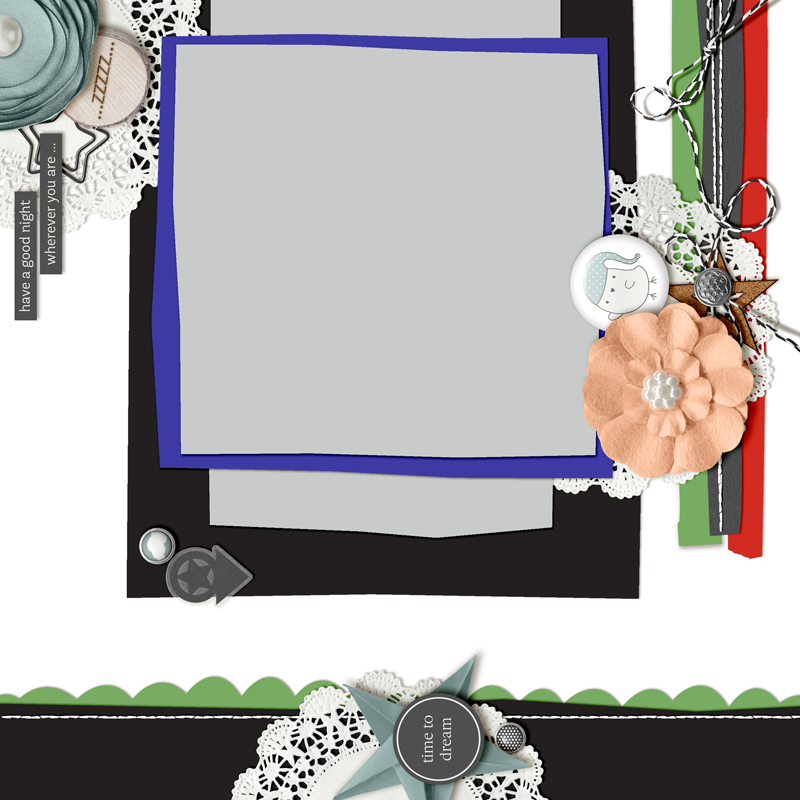 I’m a firm believer that there’s no right or wrong way to scraplift a page. Bottom line: have fun with it! Create a copy of your original Photoshop file and work from that. Don’t work on your original file. If you rotate the design, watch for your shadow angles as they will rotate, too. 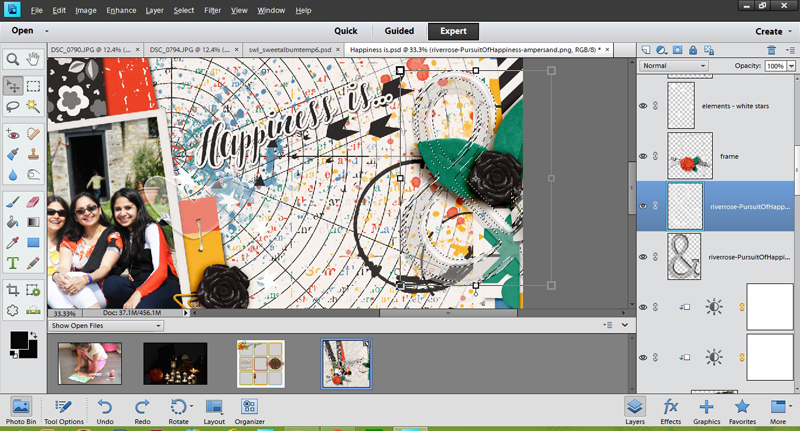 Scraplifting from your own gallery can be a great way to get your mojo going — or even just a fun exercise to do when you’re in a creative rush. It’s an easy way to expand your digital toolkit since you have all the inspiration right there at your fingertips: it’s you! If you would like to give this a try, I’d love to see what you can do with your own layout, so link me up with a before and after! About the Author Kat Hansen is a creative team member here at The Digital Press. A Director of Human Resources by day, she loves the opportunity to spend a few hours each day being creative. 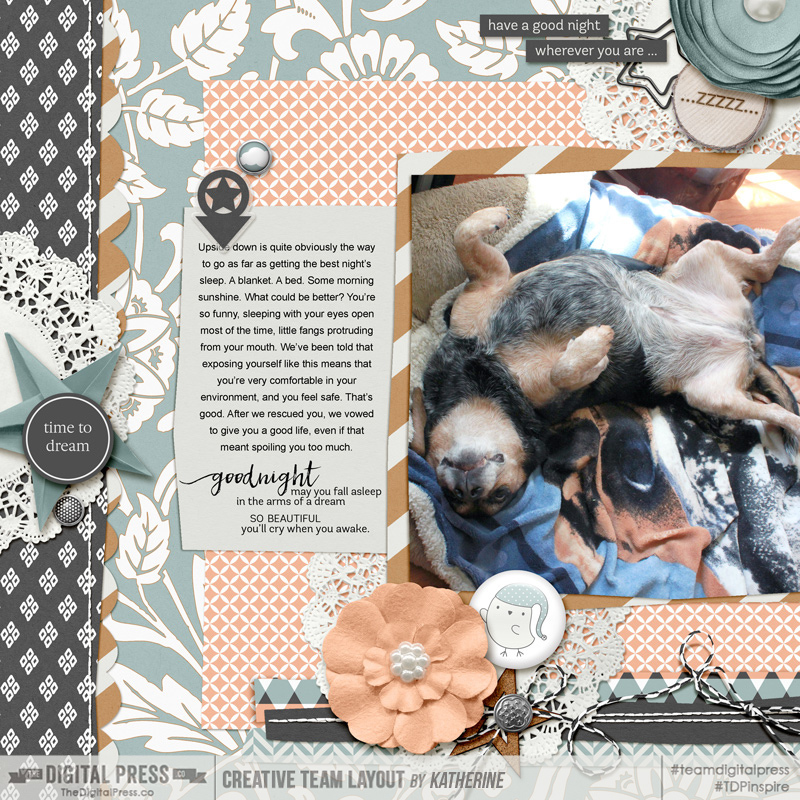 Vacation memories feature pretty heavily in Kat’s scrapbooking pages, as do her son and “daughter” (of the four-legged furry kind). Kat has quite the sense of humor (she “blames” her father for this), which she incorporates into her journaling and memory-keeping. I know most of the world is coming into summer now, but where I live we have the most beautiful autumns and I wanted to make some decor to celebrate that. 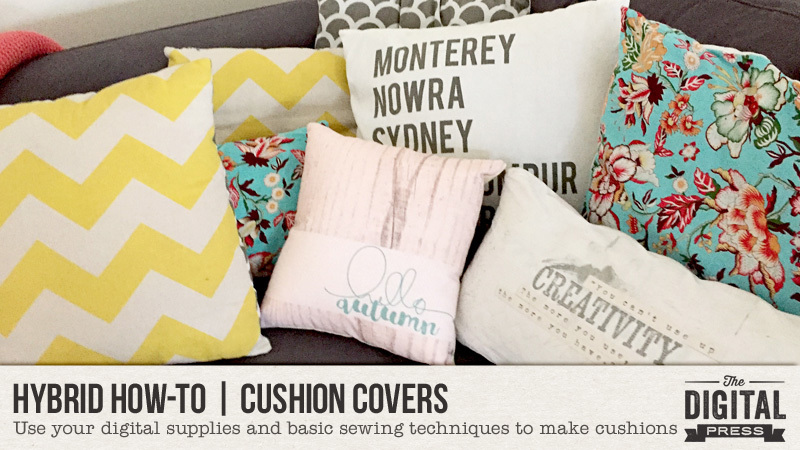 I make a lot of my cushion covers; they are so easy to do. Today, I will show you how! First, I design the cushion cover in Photoshop. My printer prints up to A3, so that’s the size of the page I start with. 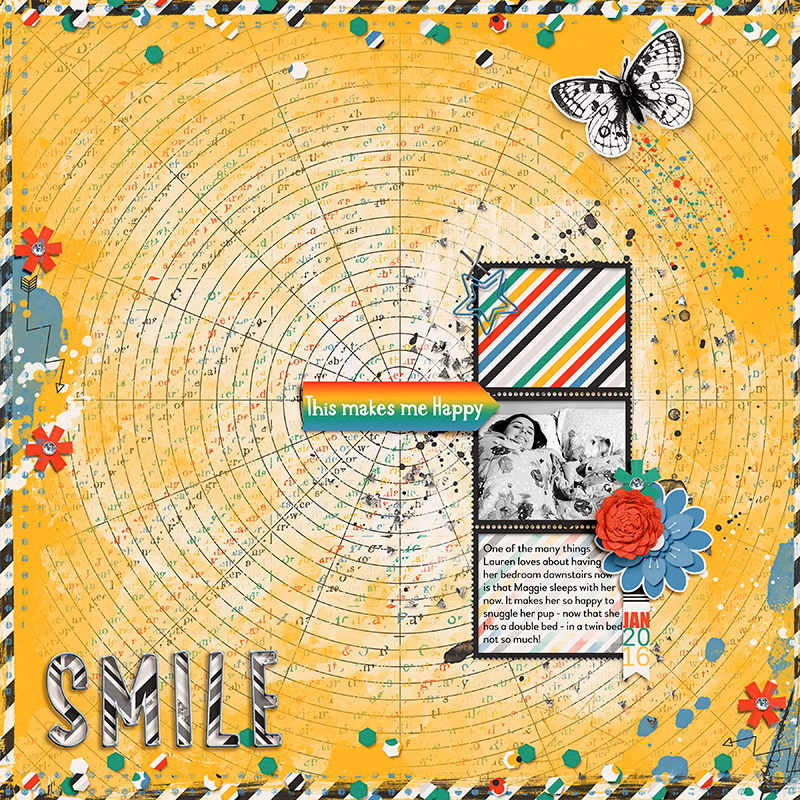 For this project, I used Grateful Papers by Little Lamm & Co. and Wondrous Stamp Sheet by Karla Noél. After creating the design, I cut fabric to A3 size. 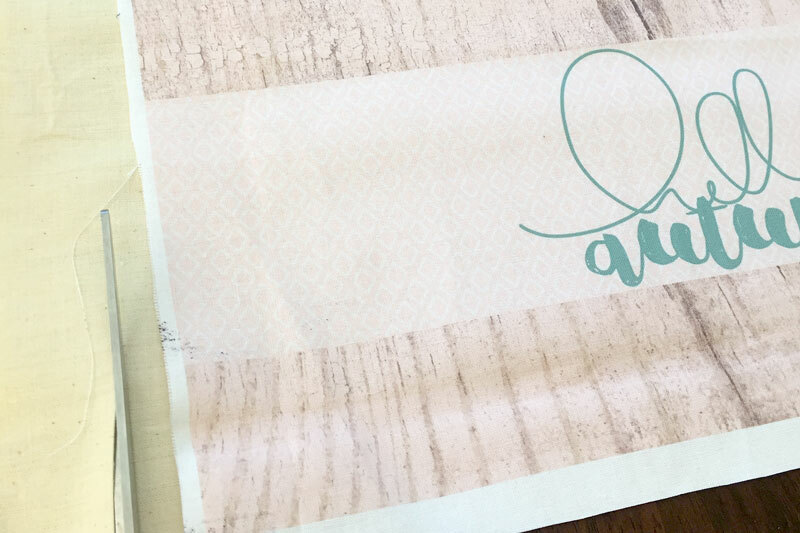 Make sure your fabric is ironed completely flat and stuck to the paper with double sided tape. The top edge should be stuck right to the edge of the paper. 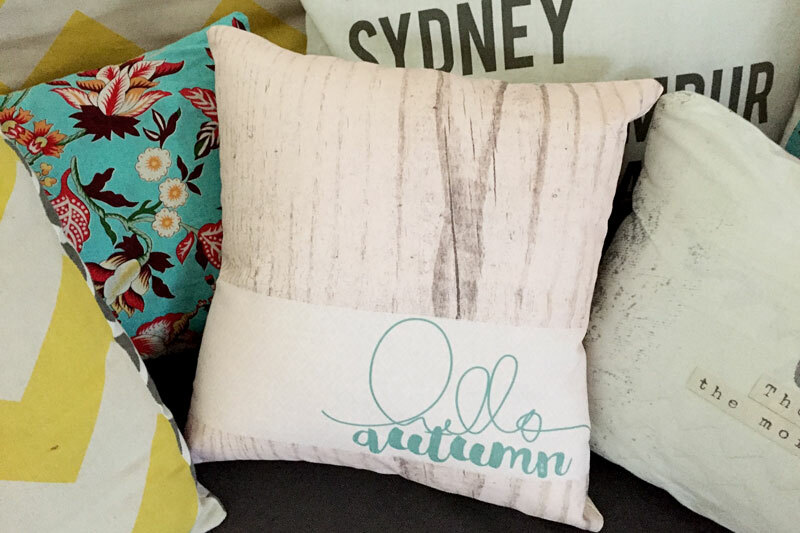 Print your design onto the fabric. *NOTE* The ink will not be colorfast, so if it gets wet… it WILL run. You can use transfer paper if you want your design more colorfast, but I change mine around often, so its not a big deal for me. If mine gets wet, I just make a new one! You will also need to cut a back for your cushion cover. I purchased a small cushion from IKEA that already had a pattern on it and wanted to make sure the pattern didn’t show through on the front, so I cut an extra piece of calico. Cut them slightly larger than your design to allow room for seams. To make my cover look a bit more quilted I decided to sew where the different papers meet. 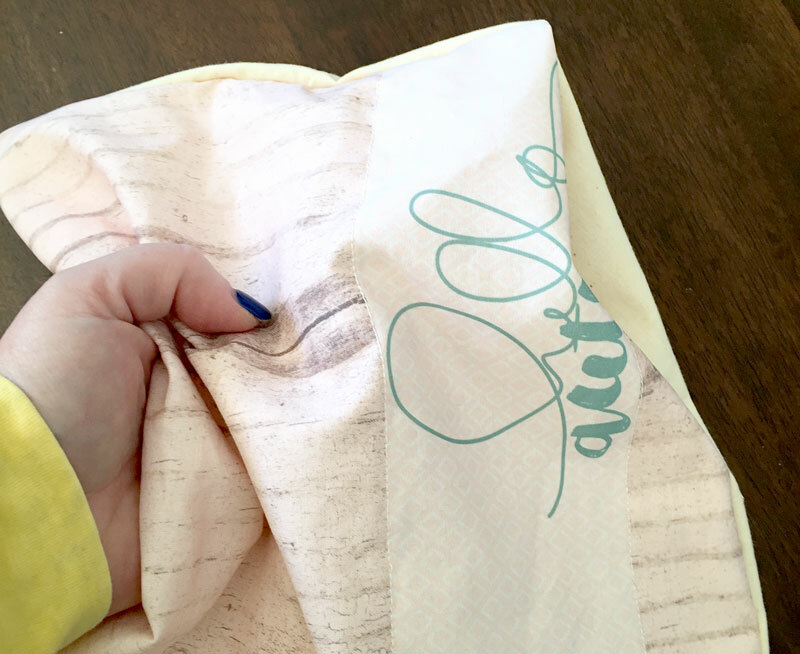 Do this on the front so you can see where you need to sew. 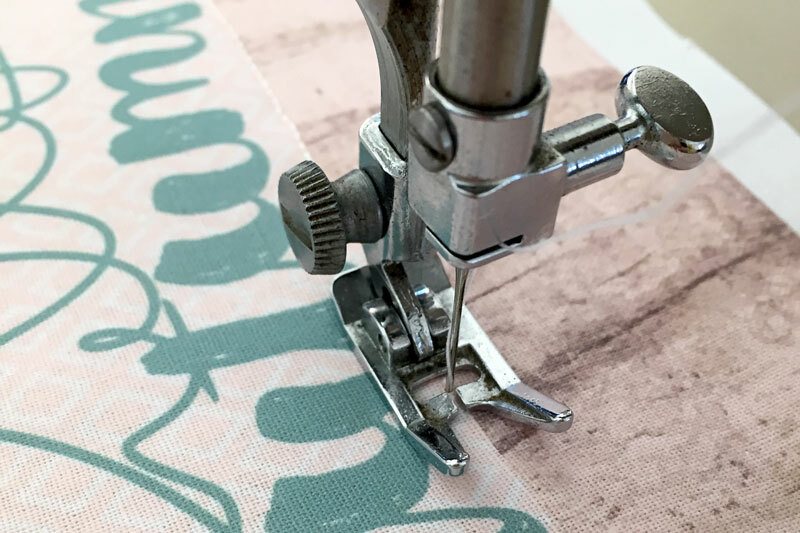 When you are happy with your design, put the ‘right’ sides of your fabric together and sew around the edges, making sure you leave a large enough gap to put the cushion in. 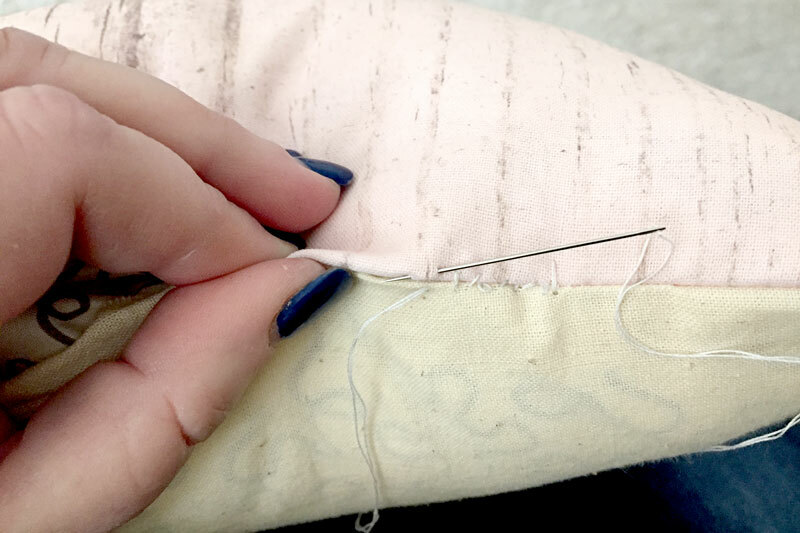 Turn your cover inside out, paying attention to the corners, stuff your cushion inside and hand stitch up the gap. 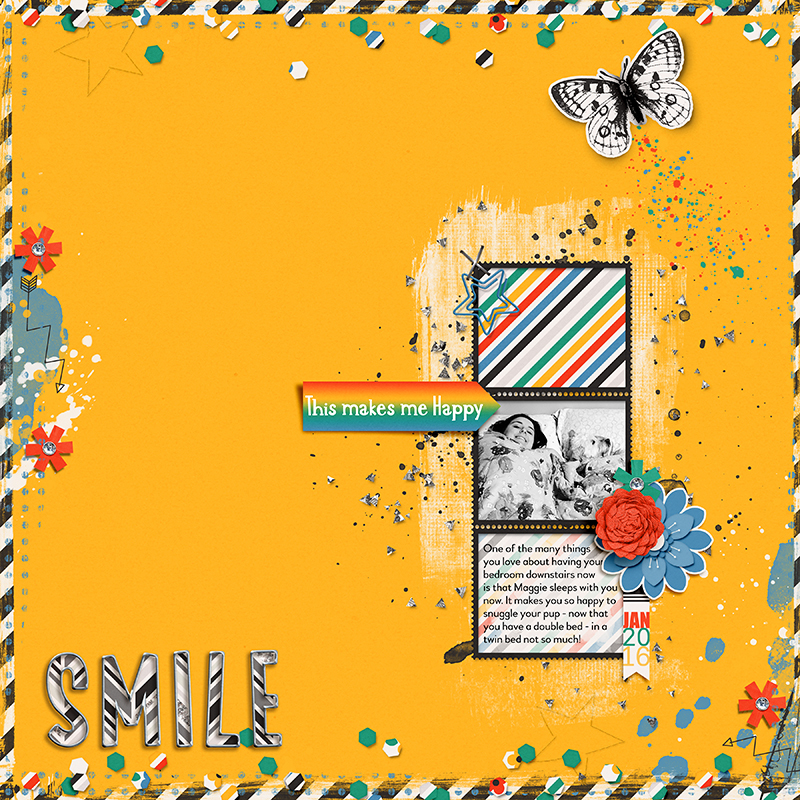 About the Author Amanda found digital scrapbooking in 2006 as a paper scrapper who was frustrated with the limitations of paper scrapping products. 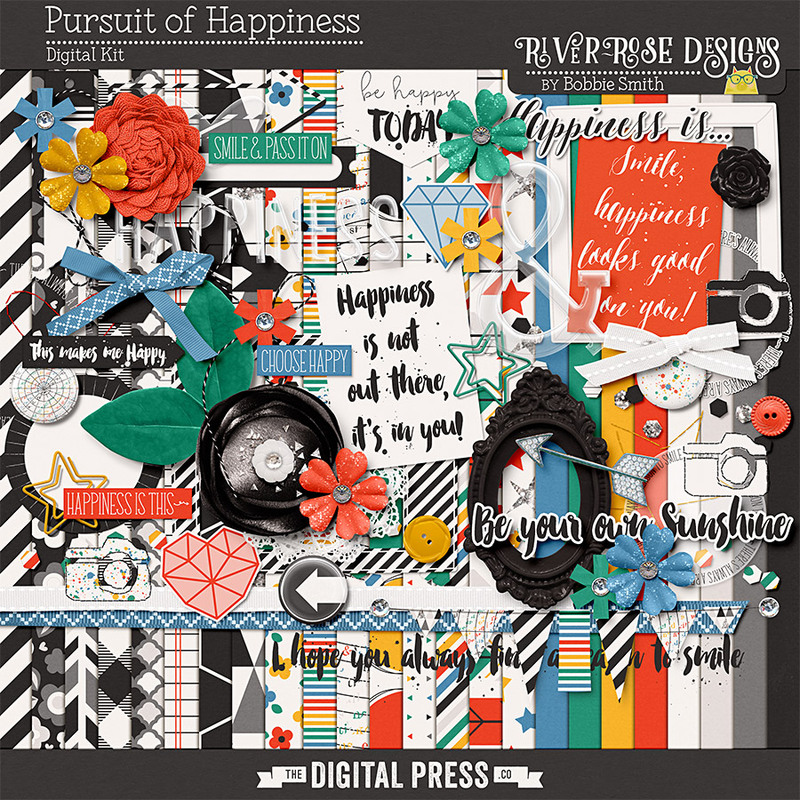 She now loves to combine paper and digital products and techniques for her pages and projects. She is the wife of a Naval Officer and has two teenage children. She lives in Australia, and has also lived in the U.S and Malaysia and loves that she has had the opportunity to travel the world with her family. Have you ever noticed that the preset shadows don’t work so well with vellum and other transparent elements? I struggled with it for a long time, and although I can’t profess I have mastered it all… I do have a trick or two to share with you today. Now the biggest quibble I have is that dark shadow showing through the transparent acrylic element. See how “grey” it looks? Logically, any transparent/translucent object that lets light through shouldn’t throw such a defining shadow. And that’s what we need to modify. Now, with that selection still on, you will click on the shadow to “cut away” the selection. Now you have two layers of shadow: one that shows immediately beneath the element, and the peripheral shadow that sticks out around it. We want this peripheral shadow to be pronounced — while at the same time downplaying the central part (see layer 2 in the screen shot). c) If your transparent element is on a solid paper or background, it helps to recolor this part of the shadow in darker hue of the same color. Play around till you are happy with the result you achieve. I hope you found today’s tips to be useful! 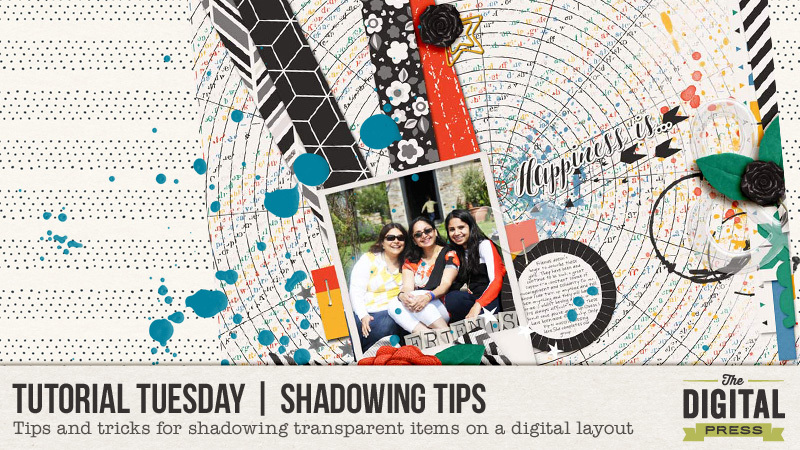 If you have your own tricks about shadowing transparent items, please do share them. I would love to try out something new. Until next time, then… happy scrapping! About the author Shivani Sohal is a donner of many alter-egos. A finance professional by day in busy London, she morphs into a seemingly normal mum of two in the evenings and weekends. She is constantly found with her fingers in too many pies and juggling the metaphorical balls. That is living on the edge for her; aided by the two ankle biters and a darling hubby who define the warm and mushy for her. She is ferociously dedicated to memory keeping – almost immune to any nay-sayers (or equally disruptive crying children or annoying house fires!!! ); keeping her head down and forging ahead at all times. I say it every year — but man, time sure flies by! There is no way June is just a few days away! Is it even possible? 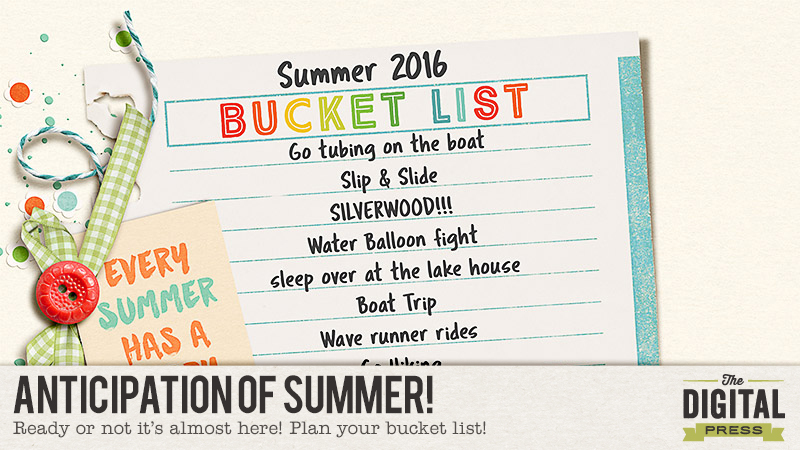 My kids have an official “countdown until school is out” going… so I had to get myself in gear and get our Summer Bucket List ready! I love the easy schedules of summer break — the “we can do nothing if we want to” attitude! I love the slower pace of life, and enjoying our lovely weather & beautiful surroundings here in Eastern Washington. Are you excited for summertime? 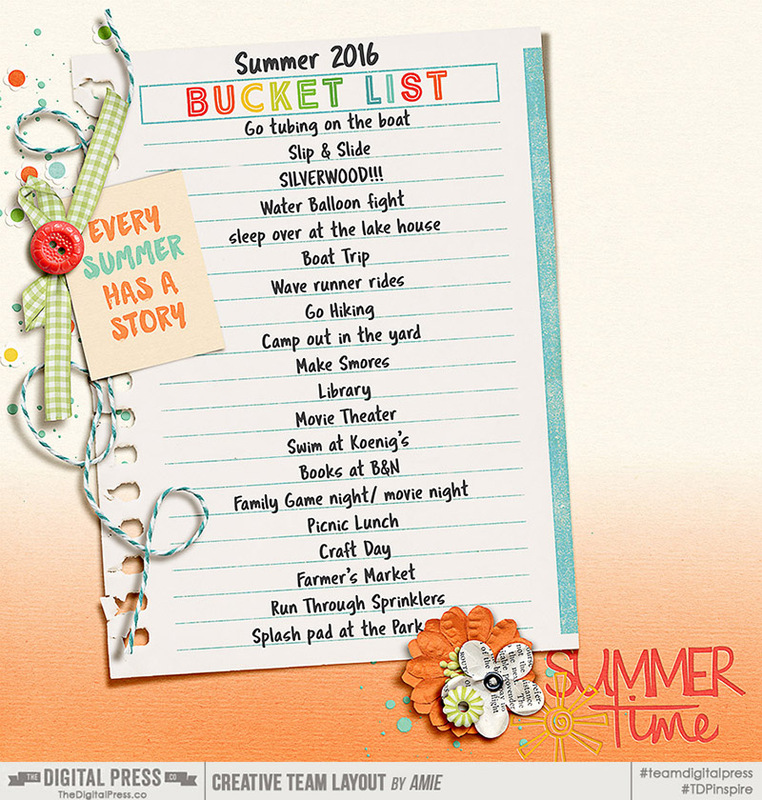 Join me in our forum to join the challenge that is related to this idea, above… and create/share your own summer bucket list with us! 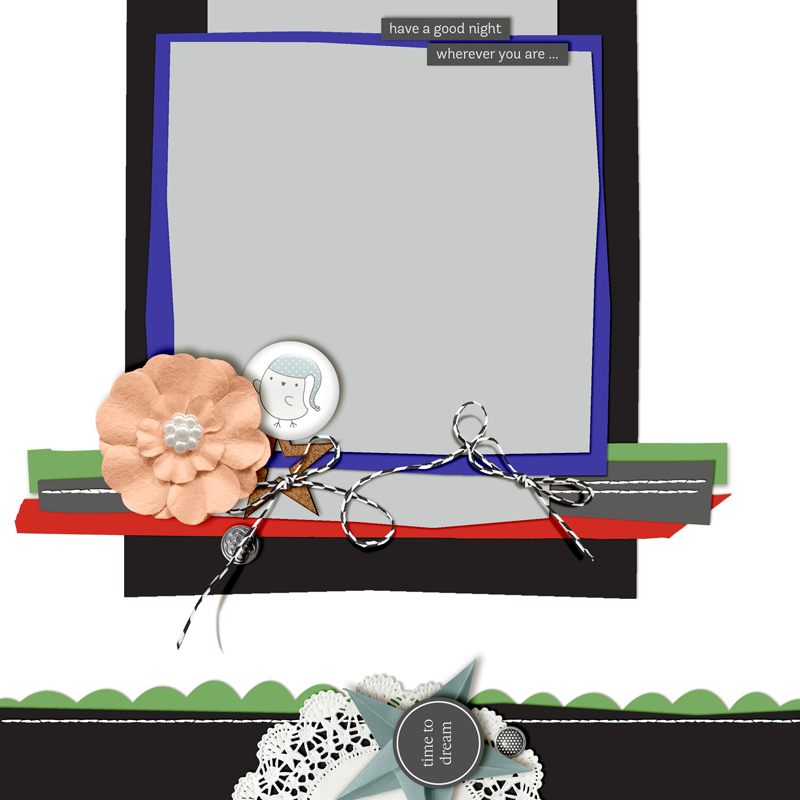 About the Author Amie is a craft-loving dental hygienist who lives in Washington state. She loves her husband, her two kids (ages 8 & 5), and her English Bulldog… as well as coffee, baking cupcakes, daffodils, glitter & sprinkles, reading a good book, and lip gloss — not necessarily in that order. 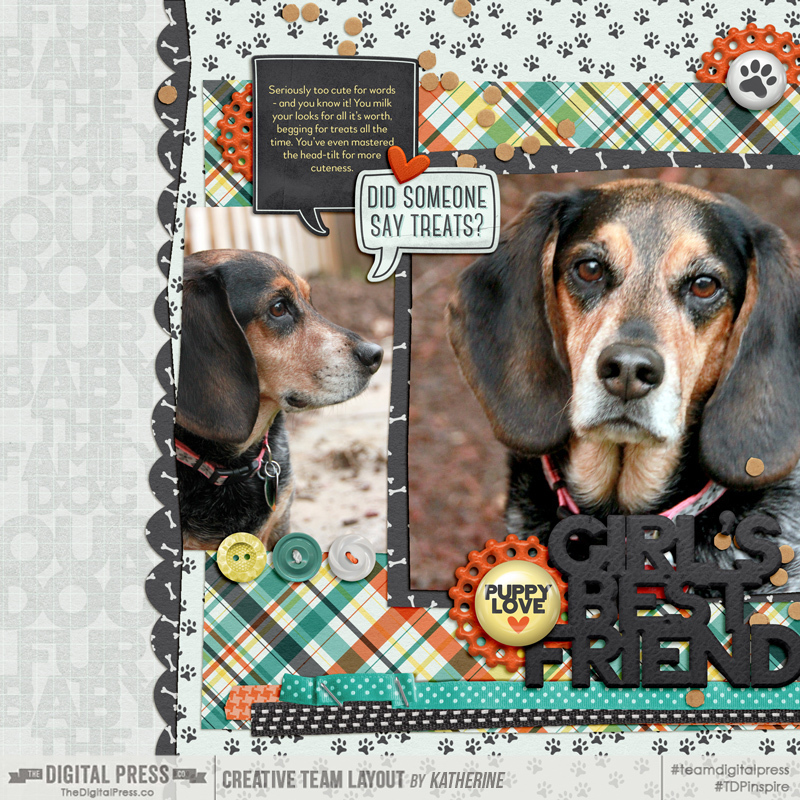 Have you ever created a layout and decided it just needed a little more “oomph”? 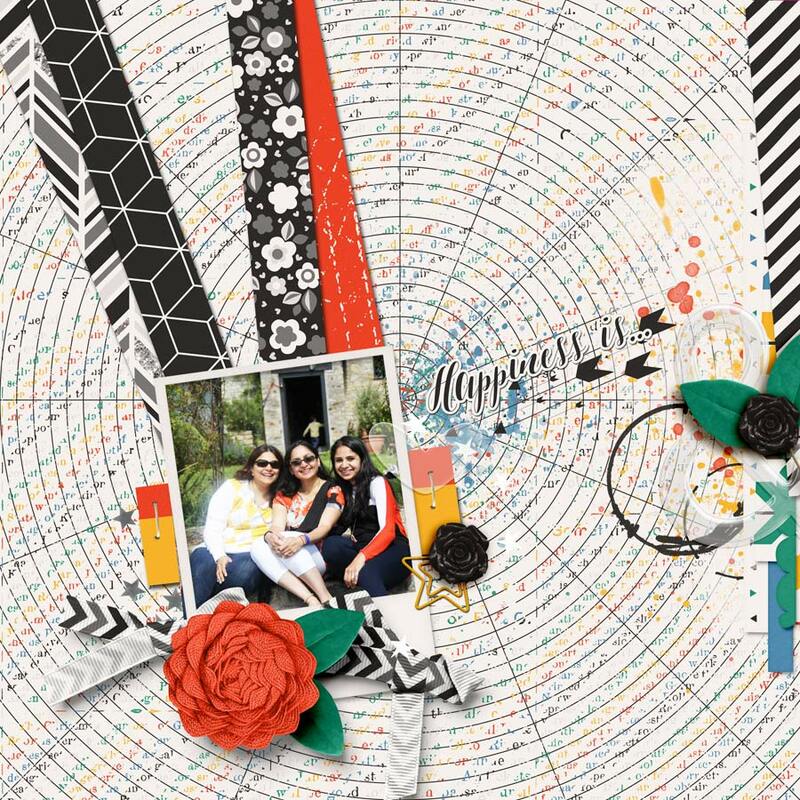 Or have you designed a layout and the kit you’re using has so many amazing papers that you simply have to find a way to use more of them? If so, I’ve got a quick tutorial for you. 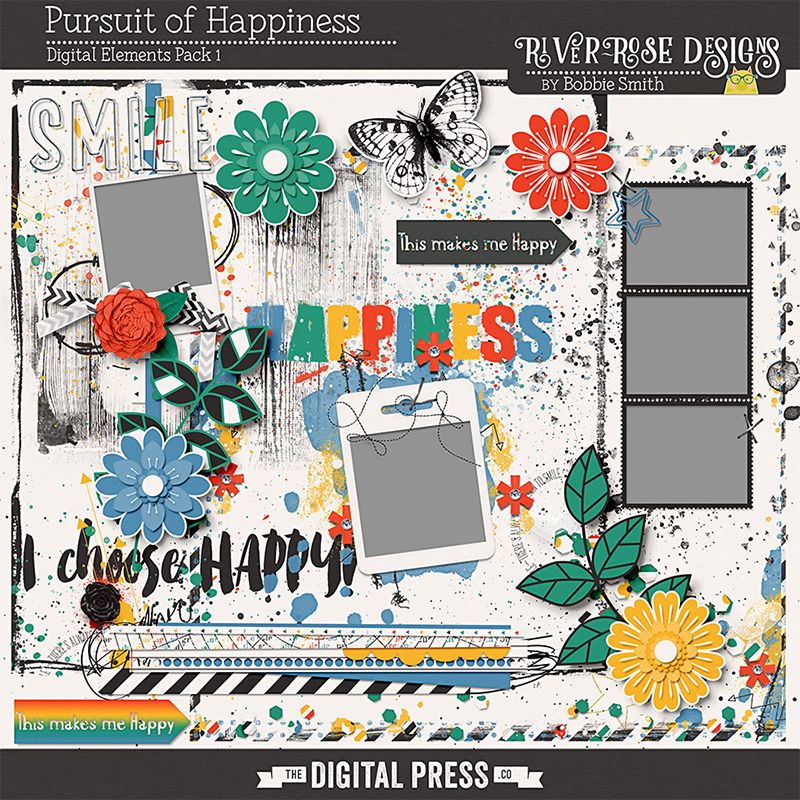 I created my page using River-Rose Designs’ Pursuit of Happiness Full Kit and the Pursuit of Happiness Extras Pack 1. I created my page with the solid colored yellow paper as the background. It was a nice solid color that allowed all of the artsy elements, cluster frame and page border from the kit to really shine. The look was a bit too stark for me and I wanted to tone it down a bit so I chose another paper from the kit and “painted” it onto the background paper. Let me tell you how you can quickly and easily accomplish this look. 1. 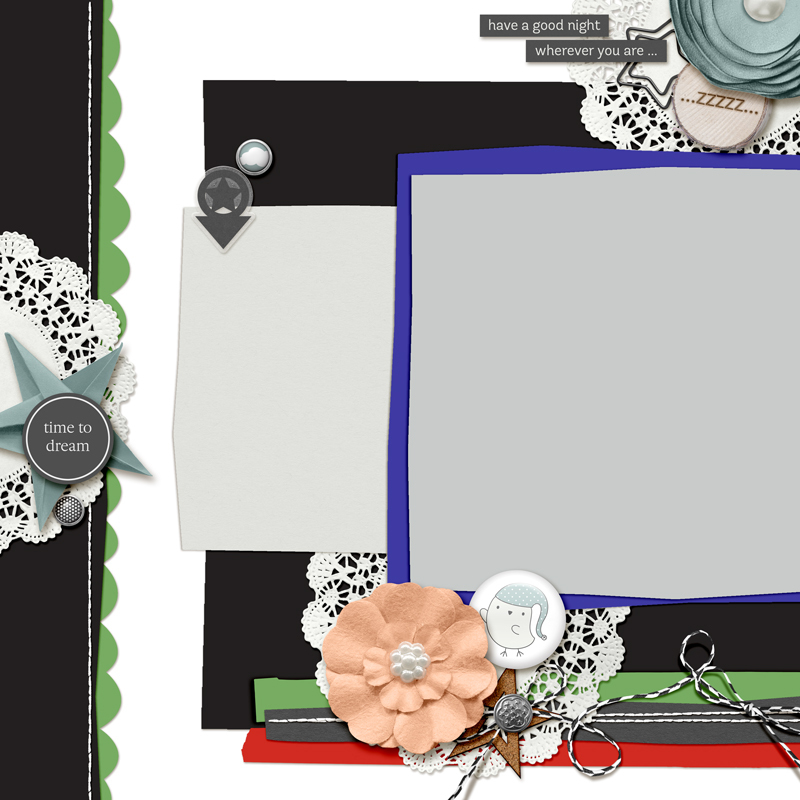 Add the background paper to your layout. To show you where I started from, here’s my layout without the painted paper layer. 2. 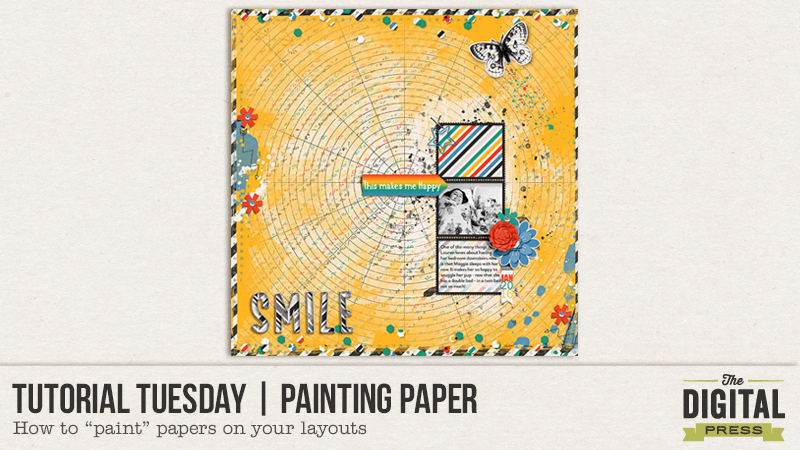 Add the paper you want to “paint” onto your background paper to your layout. 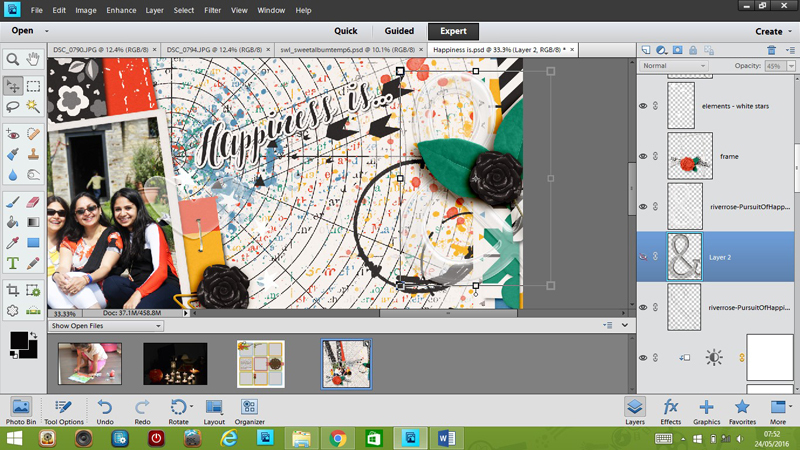 I chose the paper with the circular design from the Pursuit of Happiness kit. 3. 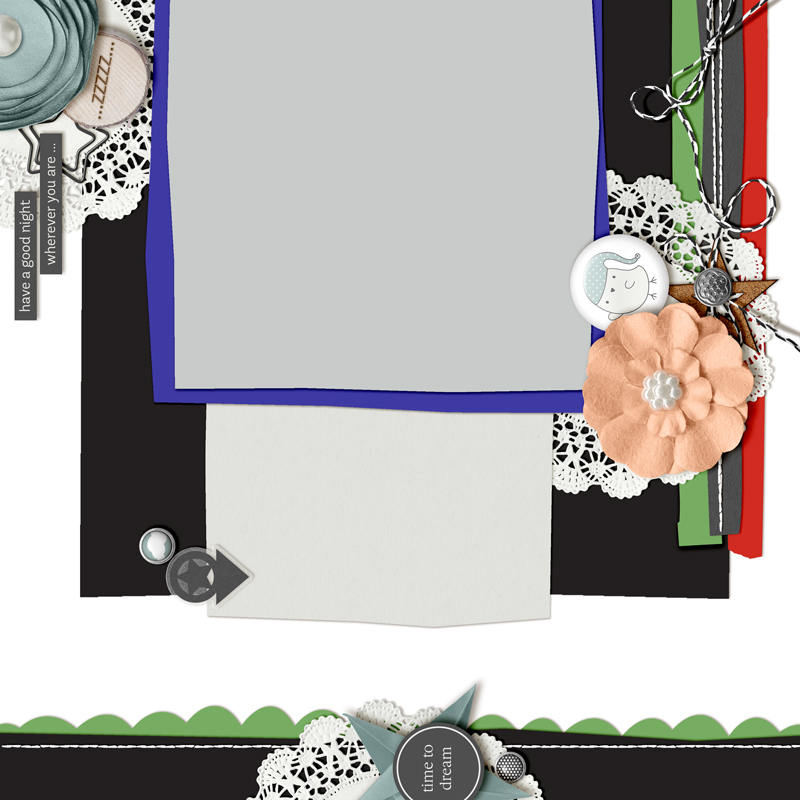 Add a black layer mask to the paper you just added. Make sure your newly added paper is active in the layers panel. To add a black layer mask press the OPTION key (Alt on a PC) and click on the Add Layer Mask icon in the layers panel. Since you added a black layer mask, the paper will now disappear. NOTE: If you added a white layer mask instead of a black layer mask, you can easily change it to black. Simply make sure the layer mask is active in the layers panel and press CMD+I (CTRL+I on a PC) to invert it. 4. Choose a brush to paint with. You are now going to choose the brush you want to use to paint your paper. I suggest using a paint/watercolor style brush or a soft round brush. You can access the brush tool by using hotkey “B”. 5. Make sure that the black layer mask is active in the layers panel. The layer mask will have a white bounding box around it when it is active in the layers panel. If the white bounding box is around the paper and not the mask, simply click on the layer mask. 6. Now it’s time to play! You can begin “painting” in parts of the paper. Make sure that white is your foreground color in the color picker then simply “paint” on the layers mask. As you paint, if you want, you can play around with the opacity of the brush or change the shape dynamics in the brush properties. Once you’re happy with the painted layer, if you want to change it up a bit more, you can adjust the layer opacity or the blend modes for the newly painted paper layer. The sky’s the limit here! Here’s my layout before and after painting the paper. Fun right?! Feel free to ask any questions in the comments or, if you have any other related tips you want to share, I would love to hear them as well! Until next time … happy scrapping! About the Author: Barbara is a member of the creative team here at The Digital Press. She is a wife, mom to two teenage kids (a 19 year old boy and a 16 year old girl) and a dog (an adorable 9 year old Soft Coated Wheaton Terrier). In her free time she loves to digi scrap, take photos and hang out with her family. Hello friends! It’s Farrah here today, and I’m hosting a journaling challenge related to the anticipation of things to come. About the Author Farrah Jobling is a member of the creative team here at The Digital Press. She lives in Denver with her amazing family — Mike, Nicholas (9), Claire (6), Hope (2 yr old puppy) & Kringle (5 mo old bunny). She works from home as a photographer and enjoys scrapping her personal photos.